In a large bowl, combine the oats, chopped nuts, flax seed, flour, cinnamon and salt. Mix well. In a small sauce pan, combine the honey, brown sugar and oil. Cook over medium heat - stirring often - until well combined. Stir in vanilla. Drizzle the wet mixture over the dry ingredients and stir until everything is moistened. Spread mixture evenly over an ungreased baking sheet. Bake at 300 degrees for 35 minutes - stirring and flipping the granola every 10 minutes. Before the final flip, mix in the dried fruit. 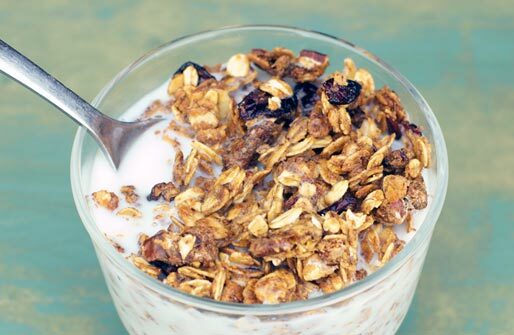 Allow granola to cool completely before serving. It will crisp up as it cools. I like a few clusters in my granola. The flour helps with that, but I'll also compress the granola onto the baking sheet to guarantee I'll get a handful of delightful clumps with a little of everything. When I flip the granola in the oven, I find it helps to use two wooden spoons. The granola in the pictures was made with dates (no raisins) and a combination of chopped pecans, chopped walnuts and sliced almonds. I love this granola because the ratio of fun flavors to oats is very generous. There's such a variety of ingredients, each spoonful is just a little different from the next spoonful. Adding the dried fruit at the end ensures that it won't get even more dry which would make it tough and chewy. 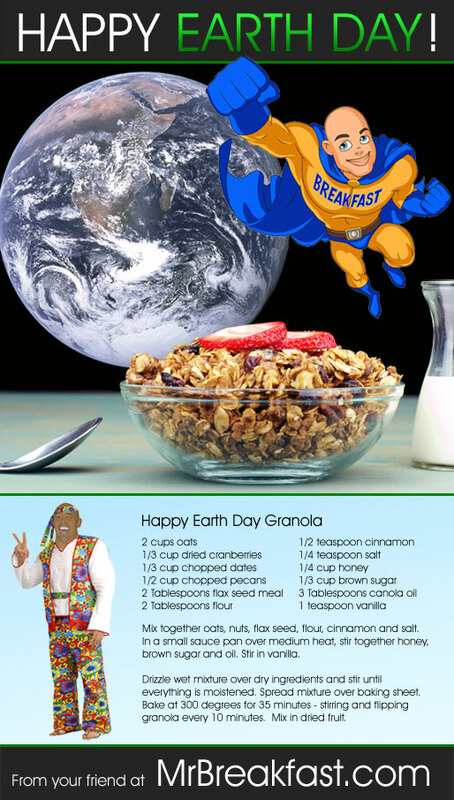 This granola was created to celebrate Earth Day. It's full of earthy goodness including dates, nuts, cranberries and flax seed. Happy Earth Day! Recipe number 3178. Submitted 4/22/2013.